With Kinect functions. And it's free. Free! "Xbox, I said Doctors, not Doctor Who"
The BBC iPlayer is finally coming to Xbox Live, with the roll-out of the much-loved catch-up service starting on Xbox Live from today. You don't need to be a Gold member to get iPlayer, so you'll be able to catch up with BBC shows through your Xbox even if you only hold a free account (negotiations over which most suspect is the reason why it took so long to get iPlayer on to the Xbox 360 in the first place). But now that it has arrived, it brings a very premium look and feel to the catch up world, with the familiar iPlayer receiving a Kinect-compatible makeover. This means that Xbox users with the Kinect peripheral can use gesture and voice control to navigate the iPlayer dashboard, as well as the traditional controller. Daniel Danker, the BBC's general manager of programmes and on-demand, spoke of the corporation's excitement at incorporating the Kinect additions: "As we continue our work to make BBC iPlayer as simple as possible, we're also excited to experiment with natural user interfaces made possible with Kinect, including voice and gesture control. "We believe it's early days for these experiences, but see a great future working with partners such as Microsoft on innovations like these." 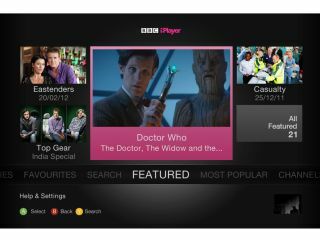 iPlayer launches on Xbox Live with just television programming, but a content update is expected to bring radio to the catch-up party later this year. Now that it's on Xbox, the iPlayer service is now available on all major games consoles, including the Nintendo Wii and the PS3. Rollout of iPlayer starts today, so Xbox Live users should receive the update at some point within the next week. Check out what we made of the interface in our hands on iPlayer for Xbox review.